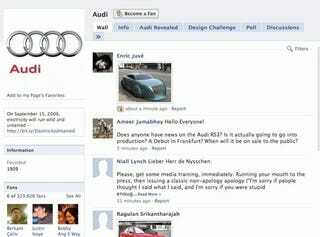 Yesterday, Lawrence Ulrich of MSN Autos reported Audi US President Johan de Nysschen called Chevy Volt buyers "idiots." Today, de Nysschen is trying to distance himself from those comments through his Facebook page. Yes, Facebook. Channeling the immense buzzing marketing power of social media, de Nysschen says, "I do not specifically recall using the term "car for idiots" during my informal conversation with the writer." In the tricky language of PRese "can't recall" translates to "I said it, but man, that was a dumb thing to say!" If de Nysschen had wanted to utterly refute the statement, he would have said, "I didn't say it" or "I was misquoted." Still, now it's been posted up on Facebook for all Audi's schoolmates and former girlfriends to read. Ulrich stands by his original story, which remains unaltered at MSN Autos. De Nysschen then continues, by writing on his wall, "the feasibility of the Chevrolet Volt as a concept is questionable." Which we admit does sound a lot better than yesterday's outright dismissal of electrics in favor of clean diesel, especially considering Audi is bringing an electric R8 to the Frankfurt Motor Show. As one of Audi's Facebook friends then responded, "cumm onn pplll!!1!"